But can you guess what beat all other tools in to the number one top spot? A rather generic term but it helpfully encompasses many types…the utility knife! To define a utility knife, this is a short bladed knife which is able to cut through many different surface types – anything from wood to cardboard. A modern utility knife has a blade which snaps off so that it is easily replaceable when it is getting a little blunt so as not to damage the item being cut through snagging or tearing. The Stanley Knife – a small but heavy duty, extremely effective piece of kit which no one – home DIYer or professional craftsman – should ever be without. There are many varieties to choose from, though some more popular than others, you will hard heard of Stanley. 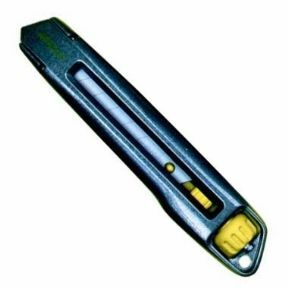 Stanley, for example, make many different types of snap off blade utility knives, including the Stanley Fat Max and the Stanley Interlock Knife. The Stanley Fax Max has a blade wiper which helps to elongate the life of the knife and the blades individually, making it more economical as it lasts longer when you remove the excess debris. Its handle is soft and padded enabling you to have maximum comfort and control, both at the same time. The Stanley Interlock Knife is an extra heavy duty knife with snap off blades or the option of non segmented blades. Despite it being a heavy duty and very sturdy knife, it is a very light knife because it is made out of die–cast metal. The interlocking mechanism is easily operated by being twisted and the wedge lock keeps the blades securely in position.